For many, jet lag is the bane of travel. Just when you want to be fresh-footed to explore a new and exciting destination, insomnia, headaches, and a general disorientation pop up and throw your travel plans for a loop. Many have their opinions on curing or even preventing jet lag, ranging from using high-tech devices to drinking lots of water — and while there is no known “cure-all” for jet lag, the next best thing after scientific proof is advice from strangers. 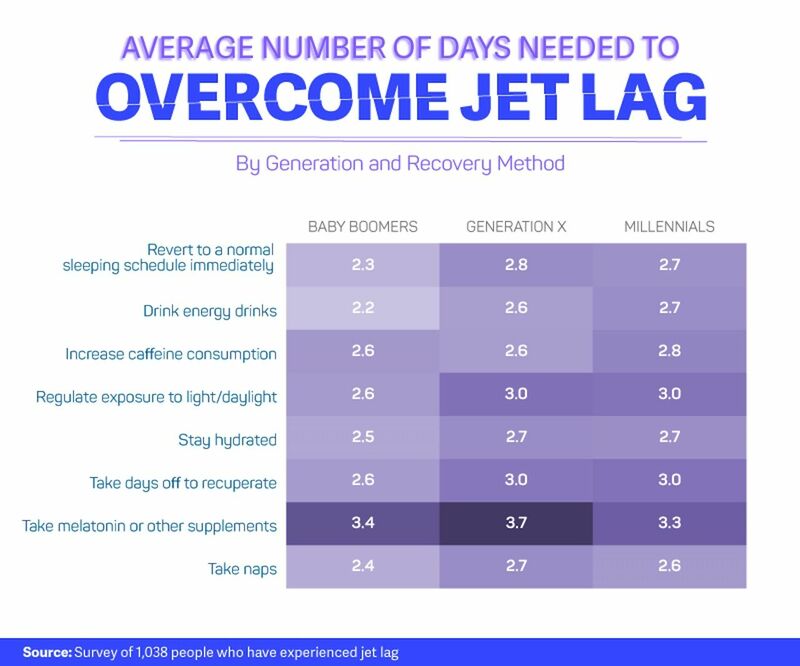 Mattress company leesa polled over 1,000 frequent travelers, both men and women, between the ages of 18 and 85 in hopes of discovering the most common symptoms of jet lag and the most effective ways to combat it. As you begin planning your fall and winter travel, here are the study’s findings. The study found that nearly 50 percent of travelers experience jet lag on both ends of their trip. The survey broke results down by age group, with baby boomers, Generation X, and millennials each having a seat at the table. Many key symptoms and prevention methods pointed to generational differences. Baby boomers, the oldest of the three age groups studied, are surprisingly able to recharge the quickest — generally needing about 2.5 days. Millennials fall between 2.5 and three days, and Gen X’ers need nearly 72 hours. Taking medication such as melatonin actually proved to be the one factor that delayed recovery the most, with all three generations saying it took well over three days to feel ripe again. Taking naps and, perhaps contradicting that, maintaining a consistent sleep schedule were cited as the best way to recover quickly. 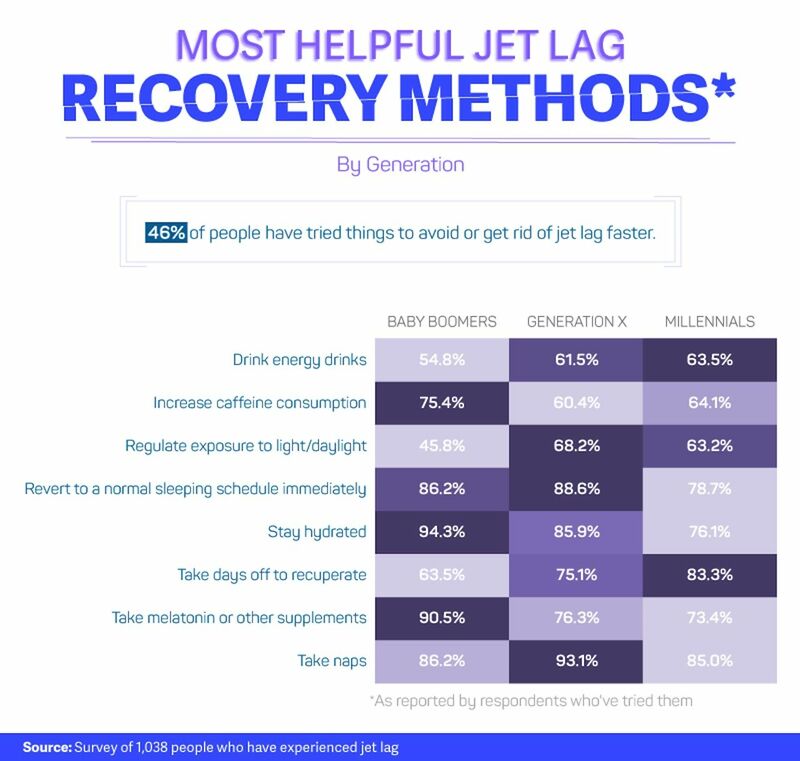 The study also polled participants on their most common jet lag-induced symptoms. 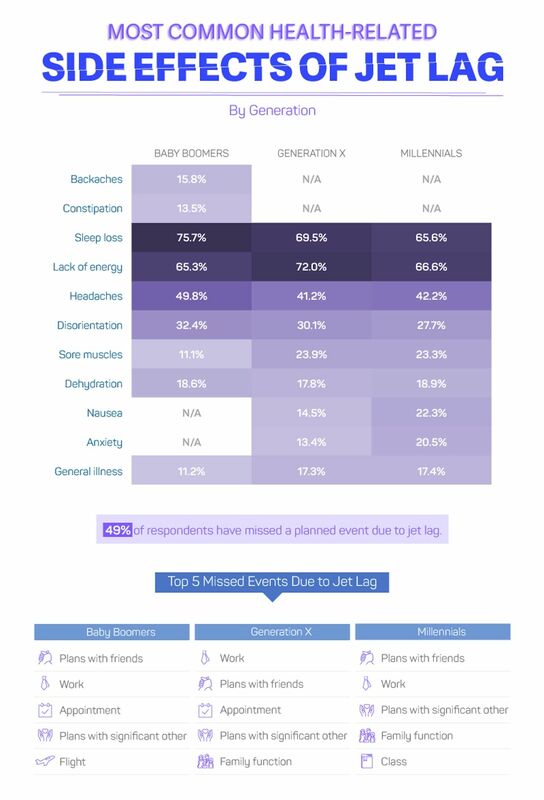 Millennials noted missing plans with friends as jet lag’s most common impact on their schedule, while their Gen X counterparts placed missing work at the top. The most common symptom across generations is a headache, experienced by 42.4 percent of millennials after flying, on par with the 41.2 percent of those from Generation X and 49.8 percent of baby boomers. The boomers showed their age in the study in one key way — more than one in 10 suffered from backaches and constipation after flying. Fortunately for millennials and Gen X’ers, those side effects haven’t kicked in yet.